Like other big banks, the history of Bank of America (B of A) has documented ties to slavery. Several of their predecessor banks had ties to slave-owners, even accepting slaves as loan collateral. But what joins the history of big banks like B of A to the institution of slavery isn’t a matter of documented names, but the historical fact that American finance was built on foundational theft, of profits from slave labor. Throughout this history, the banks have made sure to offload investor risk while still collecting interest. In the past the risk fell on the slaves who labored faster to ensure expected profit rates to their owners and interest rates to lenders, while for this era’s financial crisis, it has fallen on struggling homeowners through the destruction of their assets and middle-class security. In the aftermath of the Great Recession, as the financial security of our school system deteriorated, Bank of America profited from its toxic debt deals with the city and school district. The CPS budget for this upcoming school year has been slashed by over $200 million, much of it affecting services to our neediest students. 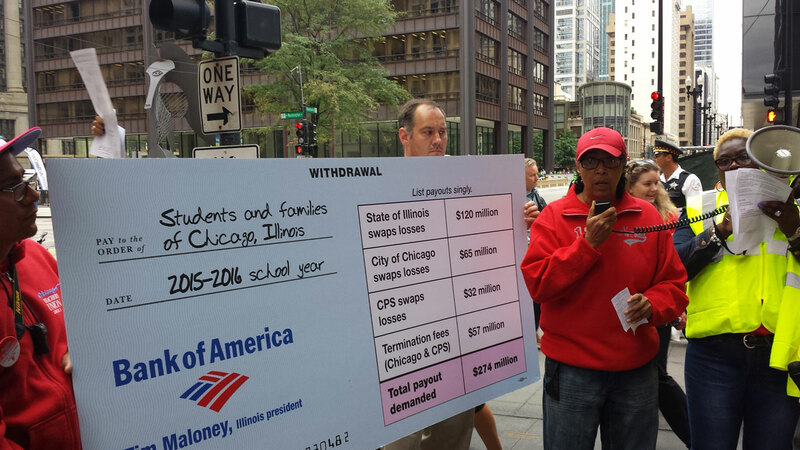 Meanwhile, financial institutions like B of A are imposing over $200 million in penalty fees on CPS from toxic swap deals, deals from which the banks have already reaped hundreds of millions from the CPS budget over the years. However, it’s not only with these toxic swap contracts that B of A shoulders our society with all the risks as they earn profits. Bank of America was the lead bank in originating subprime loans and home foreclosures. The mortgages that banks like B of A bundled into larger loans to sell to investors shielded the banks from risk, while creating the conditions for a toxic asset bubble that inevitably crashed down on the backs of homeowners and the wider economy. B of A also had the worst record in providing relief to customers through the government’s Home affordable Modification Program. Instead of helping customers modify their agreements, as required by federal government, B of A prolonged the process, collecting fees while sub-contracting out the modification program into what was – as described by a former employee – an “absurd, self-contained ecosystem of worthlessness”. B of A is also engaged in a variety of everyday predatory lending activities such as providing financing to payday lenders and pushing high-interest loans. Not only does B of A take systematic advantage of under-banked communities through predatory lending and damage the middle-class through abusive mortgages and foreclosure practices, but they have also undermined provision of public services by assisting hedge funds with corporate tax avoidance. At the beginning of this summer CPS claimed that a cash-flow crisis made it unable to both make its full required pension payment for Fiscal Year 2015 and to open schools this fall. Although CPS blamed the legislative grid-lock in Springfield, there was nothing unanticipated about the June pension payment, which had been fully budgeted for this past fiscal year. What CPS did not anticipate when it passed a budget last year was a roughly $220 million penalty payment to partner banks that came due when CPS’ credit rating dropped to the lowest investment grade this spring. Instead of going on a press offensive when this sudden cash need came due, the city and CPS avoided the topic whenever possible. When pressed, district officials claimed to be in continued negotiations with the banks. However, the district had already paid out a portion of these penalty fees – even as they threatened to skip the pension payment. CPS ended up paying their legally obligated payment to the pension fund, after a massive $1 billion expansion of their short-term credit line. Schools are opening this fall, but only after CPS imposed $200 million in cuts to programs such as elementary sports, services for our most needy students, and another round of borrowing at high interest rates, including borrowing to make the rest of the penalty payments. City and district officials claim they had been ‘negotiating’ with the banks. In the summer of 2014 when the city and school districts credit ratings were still above junk, city officials were reportedly negotiating a lower threshold for when they’d have to be forced to make the penalty payments. Since the credit downgrading this spring, district officials were reportedly negotiating the timetable of their penalty payments. It has now come to light that the school district doesn’t even know whether they ever investigated their legal recourses. Despite being armed with evidence that Bank of America entered into deals with the city and schools without fully disclosing their knowledge of impending risks, the city’s position on the penalties has been one of complete capitulation. In the fall of 2014, when the Chicago Teachers Union, the City Council Progressive Caucus, the Grassroots Collaborative and other community groups, amplified demands for legal action against the swaps, Rahm indicated that his administration had no intention of aggressively pursuing a suit, saying “there’s a thing called a contract”. With groundswell opposition in the streets, and a legal model with success in other municipalities around the country to recoup losses, the city’s public response was instead what we’d expect to hear from the swap counterparties. It is apparent that the city and CPS officials have not played hardball with the banks, never challenging the bad terms of the contract, but only discussing when and how they’d meet them. Bank of America is one of the leading banks in interest rate swap deals since the Recession. They earned $7.3 billion in profits off of swaps alone from 2009 to 2013. B of A has soaked the school district of $32 million from their toxic swaps, and are demanding another $37 million in termination fees. They have also reaped over $60 million from their swaps with the city. These deals were sold to municipalities as ways of mitigating risk, but in the end the governments shoulder the full burden. City officials have failed to hold the banks accountable. We must push for public accountability over the profits Bank of America has made off of our local governments and public school system. Our personal boycott of B of A’s predatory services won’t dismantle their profit engine, but is a necessary statement against them. A public movement can budge even the most recalcitrant institutions. bank of america, brokeonpurpose, swaps. Bookmark.